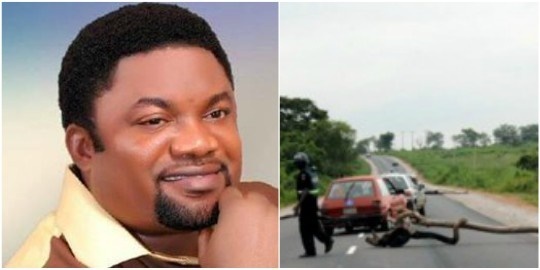 A Pastor, who was trying to evade duties check, has knocked down a customs official on a highway in Akwa Ibom State. A pastor and founder of Kairos Rhema Embassy, Uyo was driving in an SUV along Eket-Ikot Abasi-Port Harcourt Highway, when he was reportedly flagged down by customs officers at a checkpoint around 10.30 a.m on Thursday. But the pastor refused to stop, as he attempts to evade duties check on the Akwa Ibom State highway. A customs official that was on the road was not fast enough to escape being knocked down by the pastor. It was gathered that the pastor had slowed down, giving the impression that he wanted to stop. But when one of the customs officials, Daneke Emmanuel moved closer to him, he fired back the engine at full throttle and hitting the official in the process. The injured official is currently receiving treatment at Immanuel Hospital, Eket. “He (the pastor) slowed down the vehicle, so we naturally thought he was pulling over,” the injured officer, said. The pastor was said to have sped off after hitting the officer. "He pulled over the brown colour Toyota Highlander at a short distance along the highway when he noticed that a customs vehicle was about giving chase. “He flung open the car door, walked away from the car and then suddenly slumped on the ground as though he was in great pains." " As we were about to find out what was wrong with him, another occupant of the car jumped onto the steering and ran away with the car,” an officer said.